Thirteen years ago, the U.S. coalition invaded Iraq and set in motion a series of unexpected events that changed the Middle East. During that time, between 160,412 and 179,327 civilian Iraqis were killed, 4,497 Americans lost their lives, and 32,222 were wounded. The financial cost to the U.S. now totals more than $2 trillion and could climb to $6 trillion over the next four decades. The ostensible reason for the invasion was the Bush administration’s assertion that Iraq had weapons of mass destruction (WMDs) and was prepared to use them on U.S. allies in the region. Saddam Hussein had already killed thousands of Kurds in March 1988 with a gas attack in Halabja, the Kurdistan region of Iraq. But no nuclear or biological weapons were ever found. Related: After Retaking Ramadi, Is Iraq Ready to Fight for Mosul? Following Saddam Hussein’s removal as Iraq’s leader there were three temporary governments until Nouri al-Maliki, a Shiite, was elected in 2006 and ruled for eight years. Under his watch, a deeper wedge between Sunnis and Shiites was created making room for radical Islamists to gain traction with the Sunni minority. When the al-Qaeda leader in Iraq, Abu Musab al-Zarqawi was killed in June 2006 by an American airstrike, AQI merged with other insurgent groups, forming the nascent Islamic State, now known as ISIS. Securing Iraq as a nation that accepts different forms of Islam (the country is 60 percent Shiite and 40 percent Sunni) as well as other religious sects would be a defeat for ISIS and a triumph for the region. That’s why the recent Iraqi victory in Fallujah against ISIS is so important. This is the third time in twelve years the city of Fallujah has been the scene of a major battle against ISIS. Fallujah is located in Anbar province to the west of Baghdad, where 1335 U.S. military were killed during the Iraq war. This time, ISIS controlled the city for twenty-nine months. The group turned it into a major hub of bomb making, propaganda production, terror training and recruitment, and supplies. ISIS’s control of the city threatened Baghdad’s security and the Iraqi government’s operations in Anbar. The Iraqi government began preparations for retaking Fallujah after liberating Ramadi, the capital of Anbar province, last February. For three months, Fallujah and its surrounding areas were placed under siege. Two thirds of the city’s 270,000 residents were already out of the city when the battle started in May. As the battle for Fallujah unfolded, ISIS used the city’s residents as human shields for about two weeks. Anyone who tried to escape from the city risked being killed by the terror group. In mid-June, ISIS allowed civilians to flee the embattled city. 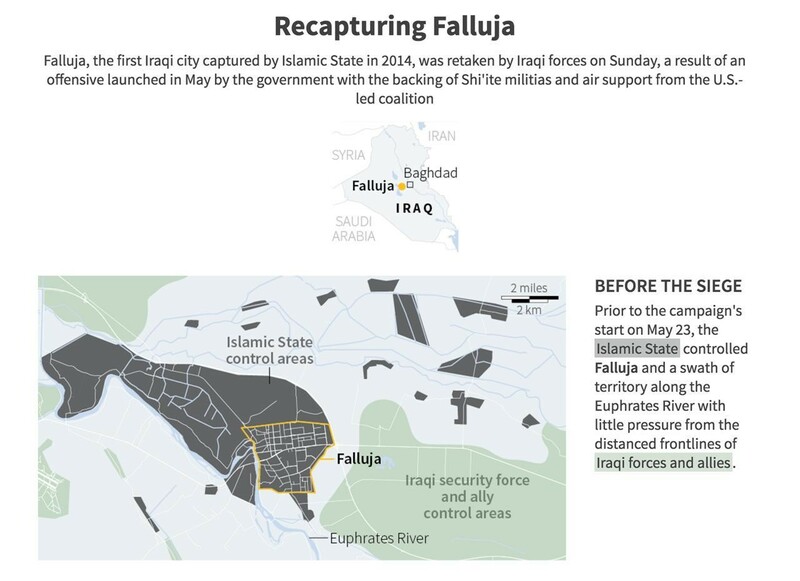 Within three days, 60,000 people left Fallujah. The exodus created a humanitarian crisis that the Iraqi government and international aid organizations were unprepared to handle. About 86,000 people ended up in ten refugee camps that lacked basic services. Most had to walk for miles under the blistering Iraqi summer sun to reach safety. For days, the civilians had nowhere to sleep other than the desert and had nothing or very little to eat or drink. The people in a nearby town along with social media activists who led aid campaigns to help the displaced of Fallujah were more effective in meeting their needs than the Iraqi government. The Iraqi government forces launched a two-phase operation to seize the city. First, clearing all the towns and villages around Fallujah, and second, breaking into the city from the south, west and east to disrupt ISIS’s control and opening paths for civilians to leave the city. The Iraqi army, police Special Forces, the terrorism combating force, and two Sunni tribal battalions entered the city in the last days of May -- a total of 13,000 soldiers and fighters, including Shiite militias. U.S.-led coalition and Iraqi air forces hammered ISIS positions in and around the city, paralyzing its leadership. ISIS’s Fallujah governor was killed in a U.S. air raid. The already weak ISIS forces lost seven ISIS commanders among the estimated 1,800 who were killed. About 2,200 men were arrested after being identified by the people of Fallujah as ISIS members disguised as civilians. If the current counter terrorism law were to be enforced, all of them would be executed. Iraqi government forces lost several hundred soldiers and fighters during the battle. About 100 civilians were also killed. In Fallujah, 90 percent of the city buildings and civilian infrastructure survived the battle unharmed. Of the original residents, only 90,000 remained at the time the battle began. Nearly 86,000 civilians left the city, with 16,000 men checked and cleared for possible ISIS affiliations. ISIS suffered such a heavy loss because the group did not believe that the Iraqi government was serious about retaking the city. If ISIS had taken the threat seriously, they would have used the common tactic of setting booby traps in the city’s buildings. What the Iraqi government forces found instead was that ISIS had a network of tunnels that were used in hiding, maneuver and storage. Eight of these tunnels were destroyed by the Iraqi government forces. The forces flooded some of them with water, so they would be unusable by ISIS. At least eight storage locations and 23 bomb and artillery factories were destroyed. These factories produced 80 percent of the car bombs that hit the surrounding areas of Baghdad and three other provinces to the north, south and west of the capital. Seven ISIS prisons were discovered in the city. Fallujah is a small city with no historic, cultural or commercial value, nor any real military strategic importance. Despite the 40-mile distance from Baghdad, Fallujah could be encircled without actually launching a major battle to control the city. Its numerous mosques were built under Saddam Hussein as a way to benefit from government-subsidized construction projects. The mosques were used by Saddam and by the post-2003 insurgency as military control centers, weapons storage and bomb-making labs. In the pro-ISIS or anti-Shiite media, Fallujah’s importance has been exaggerated. The myths circulating among Sunnis are at times fantastic, like tales of gigantic animals that attacked the U.S. Marines and drove them out of the city. For Sunnis, Fallujah is a sacred city with more than a hundred mosques that Allah intervened personally to protect from the Americans and the pro-Iranian Shiites. The pro-Iranian opposing media have portrayed Fallujah as the source of all terrorism in Iraq. Defeating and humiliating Fallujah would finally end the Sunni insurgency. ISIS has used Fallujah brilliantly in its propaganda to inflame Iraq’s sectarian strife. In a series of propaganda videos and images, ISIS turned the city into a crucible of hate for both Sunnis and Shiites. In one video dating back to January 2014, four Iraqi soldiers were captured after being overrun by ISIS fighters. They were forced to denounce themselves and agree that their punishment was death. Then, the camera showed them kneeling as a masked ISIS fighter shot them in the head from the behind. In another video from the same period, six Iraqi soldiers are shown on a truck with signs of torture on their faces and bodies. A caravan of ISIS vehicles tours Fallujah, while dozens of the city’s men, cheering for ISIS, shoot videos of the episode with their cell phones. Then, they are murdered. ISIS released a photo collection in May 2015 showing an Iraqi soldier on an ISIS truck touring Fallujah’s streets. The soldier was later taken to a bridge where he was hanged. This time, ISIS propaganda turned that soldier into a national hero in Iraq. Finally, a video was released in June 2015 showing an Iraqi soldier confessing crimes. Then he is shown standing between ISIS fighters on a truck that is touring Fallujah. Finally, he is slaughtered by a masked ISIS fighter after another propaganda speech. In every one of these videos and photo collections, the killers were shown as Sunnis and the victims were Shiites. The overall effect was clear. On social media, when this recent battle started, the city was called “the whore” whose shame must be removed. Even before Fallujah was fully cleared, the Iraqi government resumed the campaign to retake Mosul. Encouraged by the Fallujah victory, two army divisions launched coordinated attacks against ISIS to the north of Baiji in northern Iraq. ISIS has shown little resistance, which allowed the Iraqi army to advance 30 miles from Baiji. The Iraqi government will most likely reach Mosul to start the battle in August. With the loss of Fallujah and possibly Mosul, ISIS defeats in Iraq are no longer a matter of years, but months. The terror group has two options for its future: withdraw totally from Iraq to Syria, where ISIS faces similar circumstances, yet at a slower pace, or seek a desert refuge as a last resort. This is what ISIS did after the U.S. military surge in 2007. “The strategic depth for the caliphate lies in the deserts spanning Iraq and Syria…. The jihadists fight as if they were pirates, with the desert being their sea,” says Nibras Kazimi, a fellow at the Hudson Institute, specializing in jihadi groups. “Jihadists swarmed in from the desert when they took Fallujah, Mosul, Ramadi and Palmyra. They mistrust urban and rural populations…. If this depth is not shredded, then the jihadists will remain “in the fight” and hence, their cause will remain legitimate in the eyes of their core constituency,” adds Kazimi. Following this recent battle of Fallujah, the Iraqi and U.S. air forces destroyed an ISIS caravan of hundreds of vehicles fleeing to the desert. In order to defeat ISIS absolutely, two major goals must be achieved. First, a responsible Sunni Iraqi leadership needs to emerge to convince Iraq’s Sunnis that there is no way they could restore power and keep it in Iraq the way Saddam Hussein did before the U.S. invasion of 2003. The current Iraqi Shiite led governments have been accused of marginalizing Sunnis for sectarian reasons. Iraq’s post 2003 governments are corrupt rather than sectarian. If their interests were truly only sectarian, they would have provided services and development to the Shiite neighborhoods in Baghdad that are much poorer than Sunni ones. Regardless of motive, Sunni leaders promote the rift between Shiites, and Sunni extremists have even been receptive to joining ISIS. “The speaker of the Iraqi parliament is Sunni. The Iraqi cabinet is divided between Shiites, Sunnis and Kurds based on reconciliation and quota rather than the results of election or the democratic process,” says Luay Jawad Al-Khateeb, a fellow at School of International and Public Affairs at Columbia University. “In a country where Shiites make up more than 60 percent of the population, no decision is reached at the Parliament and the cabinet without reconciliation.… Iraq’s Sunnis enjoy the revenues of Iraq’s oil, which is produced in the Shiite provinces, but they don’t contribute to the federal budget with even a dollar. Yet, their leaders tell the world that Sunnis are marginalized and prosecuted,” adds Al-Khateeb. The results of the reckless Sunni leadership in Iraq is the loss of tens of thousands of Sunni lives, the destruction of Sunni cities, and the displacement of more than half of the Sunni population in Iraq. As the Iraqi government forces liberate their cities from ISIS, many Sunni leaders are still living in the safety of Kurdistan, Jordan and Turkey, trying to make deals to secure their political future or business opportunities. Without an able Sunni leader who can convince Iraq’s Sunnis that they will never rule Iraq by force again, ISIS or al-Qaeda will always find an audience among Iraq’s Sunnis. The second required task to defeat ISIS is to put an end to the Assad dictatorship in Syria, which has killed an estimated 400,000. Unfortunately, with the Russian support of that regime, this is not feasible in the near term. As long as this dictatorship remains in power, Syria’s Sunni majority will look for armed groups to defend them. Even as ISIS suffers its demise in Iraq and continues to be degraded in Syria, the terror group will continue to mastermind major attacks elsewhere like the recent attacks in Iraq, Saudi Arabia, Bangladesh, Lebanon and Istanbul. They’ll also inspire ‘lone wolves’ to conduct other attacks in the U.S. like the Orlando shooting. A side effect of destroying ISIS would be the emergence of al-Qaeda as the main hub for attracting extremists from all over the world. While ISIS looks worse than al-Qaeda to many Western observers, al-Qaeda is as determined as ISIS is to attack the West and destabilize the Middle East and South Asia. The victory in Fallujah has also given the Iraqi Prime Minister, Haider al-Abadi, a breather after several very challenging months of popular protests against corruption. Some observers consider victory in Fallujah a political boost for al-Abadi, and a greenlight for Iraq to reclaim the city of Mosul from ISIS. ISIS was always defeatable, if tackled by Iraq’s counter-terrorism forces with air support from the U.S. But that victory might not save al-Abadi. The Iraqi supreme court has nullified the new technocrat government that al-Abadi formed. The anti-corruption protests will resume with a planned million people demonstration in mid-July that could demand the resignation of al-Abadi for failure to prevent the recent Baghdad bombings that killed about 300 civilians. An Iraqi multimedia investigative journalist who covered the Iraq war, corruption and ISIS for The New York Times, The Los Angeles Times, and Mashable, he also served as a communication coordinator for the Iraqi Ministry of Justice.